Apple has been using Bing as their default search engine and web search results provider for iOS and Mac for quite some years and has decided to go back to Google last September 2017. 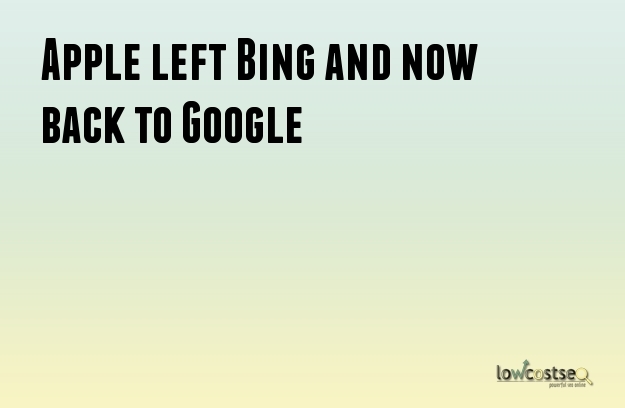 To be specific, Bing has been the search results provider of Apple devices since Apple has ended its contract with Google in 2014. For some reasons, which may have been affected by the rise of competing for phone manufacturers running on Android OS, Apple has decided to switch to Bing, another big name among search engines. However, due to the frequency of using Google over Spotlight search and a lot of iPhone or iOS devices users downloading Google Search app or making Google their default Safari homepage, Apple might have had that reason to switch back to Google. So, if you want to have “search the web results,” you will be routed now to Google instead of Bing. According to NetMarketShare in 2017, 82% of desktop PC users search using Google while only 8% use Bing, and 90% of mobile users search using Google while only 1% use Bing. It’s not really a statement that says Google is better than Bing, but it is more of lifestyle and demographic comparison. There was a survey in which people use Bing and those who prefer Google. Bing users are mostly blue-collars, more than 35 years old, less techy, and likely to have kids. On the other hand, Google users are white-collars, techier, younger than 35 years old, and University/College students or graduates. In terms of their differences in Pay Per Click, Google has more volume, more competition, reaches more countries worldwide, and is more expensive. On the other hand, Bing is the opposite because it has less volume, less competition, focuses mainly on users in the US, and cheaper. Another probable reason why Apple has finally decided to go back to Google is its interface of showing results which coincides with their principle of simplicity. When searching videos on Google, you will see a vertical list of results that display a thumbnail on the side and details beside it. You can just scroll while looking at the descriptions at the same time. With Bing, you will see thumbnails of videos on the grid so you will be judging or choosing the videos mostly based on the thumbnails rather than text descriptions. In terms of image search, Google will display tons of images you can just choose from by scrolling on the open window while Bing has quite a more complicated interface with more advanced options. If you want to search something, Google usually provides four autocomplete suggestions while Bing offers eight. In summary, there are really a lot of differences between Google and Bing so if you are using iOS or Mac, this news might be positive or negative for you based on your preference. However, if you prefer using Bing as a default search results provider, you can always change your default search results provider in your browser.